Longing for something is a strong feeling: whether it is for a person, a place or an experience. Ever since I had read Georg Forster’s ‘Journey Around the World’, I longed to experience the Southern Lights: long columns of light of the whitest colour, stretching from the horizon to the zenith, occupying the entire sky. The years passed, but the deep South of the planet remained unattainable. Finally, my husband Klaus and I travelled to Lofoten, a Norwegian archipelago north of the Arctic Circle. It was the end of February, the mountains projecting out of the sea, pointed and snow-covered. 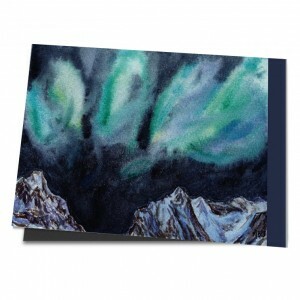 Would the coloured Northern Lights appear? Would I be able to paint them? I asked myself these questions every evening when I stood on the terrace of the holiday home and looked hopefully into the sky. But they did not come. Neither during the first, starry night, nor during the following night, when the islands were shrouded in clouds. Tomorrow we were to leave. Klaus was already asleep, I was still standing outside waiting – eagerly. And suddenly it happened: the dark grey of the cloud cover lit up in one place, then another spot lit up. The light turned green, shimmering blue, remaining vaguely hidden in the distance. It was as if a searchlight darted beyond the clouds. I had prepared my painting things as every evening, now I started spurting. “You painted the Northern Lights!” Klaus was pleased with me the next morning. “But I didn’t really watch them,” I admitted – and continued to long for this experience. The following year, we went on holiday with our grown up children to Iceland. It was the end of August, we were camping on a vast, barren plateau and were about to go to sleep, when Xira excitedly pointed to a black bank of clouds in the north. Above her a small light green glow seemed to float. “There are no Northern Lights in the summer,” Joel was saying to his sister, when they suddenly rushed toward us like a flock of ghost riders, growing taller and taller, fluttering over us as well as rushing past us. The Northern Lights! Then they vanished into the distance, turned around and returned again. Their colour was green, seeming sometimes to be a thick as velvet, sometimes as veiled as chiffon. They encircled us several times in long elliptical orbits, keeping us under their spell. Then the lights got more and more soft and transparent. Suddenly they were completely gone. The dark night remained. “That was fantastic,” Bruno finally broke the silence. “And only for us,” joked Joel. “More than beautiful,” Xira sighed. Klaus took me in his arms: “And – happy?” I nodded, touched by the events. I had expected much from this trip, but not seeing the Midnight Lights. Now I had finally experienced them and a longing was finally satisfied.